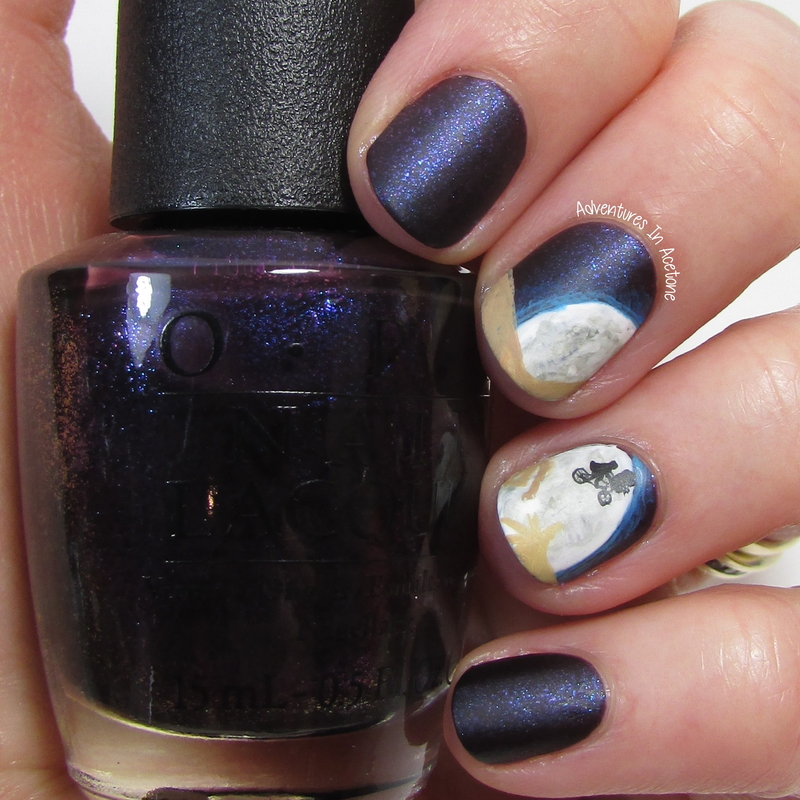 40 Great Nail Art Ideas, Films: E.T. Nail Art! Good morning, readers! 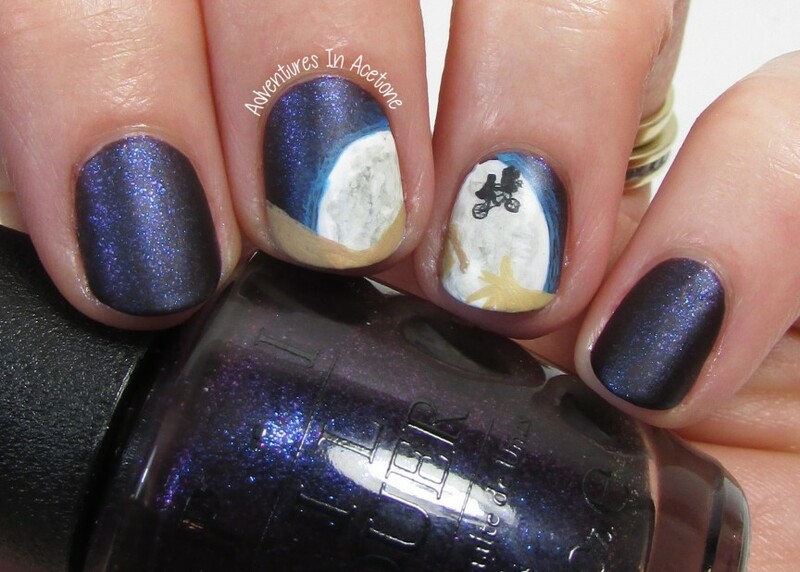 It’s time for this week’s 40 Great Nail Art Ideas post and the prompt is Films. I asked Mr. Adventures In Acetone for a suggestion and he thought E.T. would be a great and recognizable film to influence my mani. I tried to recreate part of the movie poster with the important bike in the sky scene and the glowing finger touch. I’m quite happy with how these turned out, it makes me want to watch the movie again. The base of this mani is three thin coats of OPI Cosmo With a Twist (from the Starlight Collection. Fitting, right?) and then I used my acrylic craft paints to paint the rest of the details. I am really happy with my new ÜberChic Liner Nail Art Brush because the tip is very fine and I was able to paint the bike details with it. I painted a coat of Girly Bits Polish Matte’rs to seal in the mani and leave the matte finish. 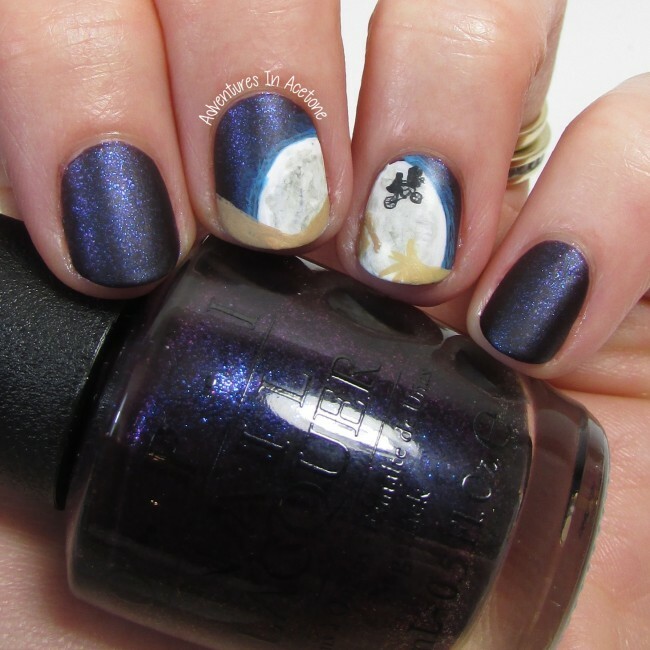 Check out what the rest of the Crumpet’s Nail Tarts did for their Films manis below! I love this movie, and your mani totally nailed it! Love it! Yay ET phone home!! !